Months ago I was on quest to find nightstands, until I found a way to make my own. See more on that post here. But now I'm beginning to think that it would have been best to buy my nightstands after all. I still love the way they look, but opening and closing the drawers is not easy since they are not on a track. This generally isn't a problem, but when it's 3AM and your trying to quickly grab something out of the drawer, it's not fun to say the least. I've nearly knocked the whole nightstand over pulling on that stupid drawer. It's probably my own fault, I doubt we measured correctly. 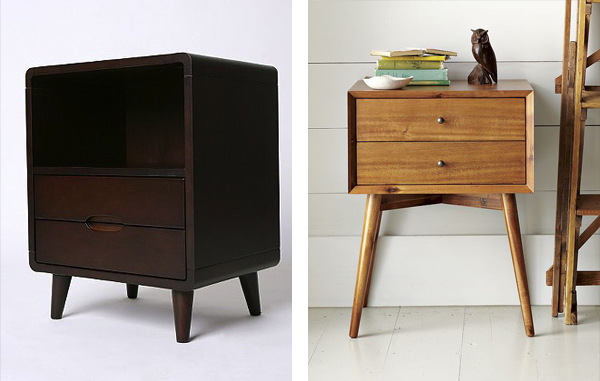 I've wanted a midcentury modern night stand for a long time and I'm very close to buying one of these. I love them both equally and I can't decide which one I want. The Urban Outfitters one definitely has more storage space, but I love the long pretty legs on the West Elm one. 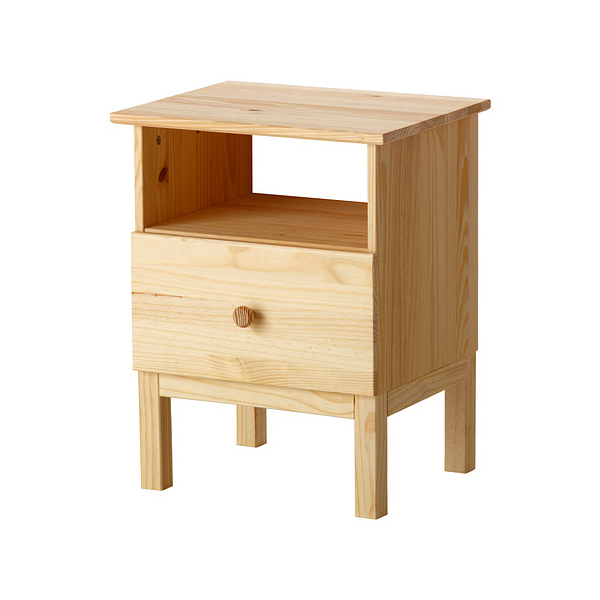 I've also considered not getting matching nightstand, since I have more space on my side. And then there is this option! This isn't Mid Century Modern, but it's $40 and completely customizable! With a nice stain or a coat of white paint, this could look really nice. And, of course, I would change that knob. I was thinking a round little knob like this would be pretty. My concern with this nightstand is that my mind would probably eventually drift back to my expensive options, so I'm thinking it might be best to get what I really want. I'll update everyone when I finally make a decision. Love the West Elm stand. Which one did you end up getting? Hi Taylor, I haven't picked one up yet, but I'm going with the West Elm nightstand! That one is still, by far, my favorite. I got sidetracked by a kitchen remodel, so my room is being neglected. haha.